and was previously with Led Zeppelin’s Robert Plant’s, Band of Joy. Colin Hawkins was on drums, and Brian Urquhart on Bass. The band’s show was mainly original songs with all of them, being penned by Keith. They were written about the same time as those on the well known Velvett Fogg album so possess the same air of psych Keith Law mystery! at his apartment in Bromley Kent. The band would travel to Central London, every day in their Ford Thames Van. 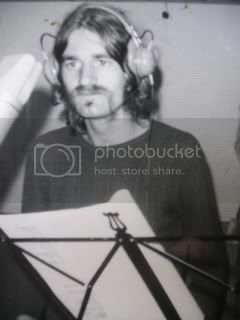 It was Keith Law, Mickey Cox and Colin Hawkins who were involved in the recordings, with Brian having other commitments. The album was recorded in June 1969, at Sounds Aquarian Studios, Kingley Street, London, just next to the famous Carnaby Street. It was a 4 track studio, with a capacity of 12 musicians. During the recording sessions many musicians, some famous, would come and join in. Michael Berg, keyboard player and engineer. The album took three weeks to complete, and then the producer got into wrangles about ‘deals’ etc. with the end result, it never got released at all, UNTIL NOW! Several tracks, including some acoustic, were recorded, initially for Polydor Records. However, the band were incorrectly advised that a much better ‘deal’ could be achieved elsewhere! This never materialized, and the master tape was stored away, only to re-surface a year later when Keith returned to the studio demanding it’s whereabouts! At the time, there was an enormous amount of albums of this genre, and the tape remained un-released. With the recent resurgence of Psychedelic music and in particular the ever growing popularity of, Velvett Fogg, demand for songs by Keith law has increased enormously! and their music, that has been in the attic, for far to long! JARDINE’S album was recorded in three glorious weeks in June 1969, at Sounds Aquarian Studios, a stone’s throw from that justifiably famous fashion hub, Carnaby Street. The sessions were fun. Polydor was supposed to release the album. Musicians dropped in to say “hello” and ended up on the record (uncredited) among them Peter Frampton, Andrew “Andy” Bown (Herd and Status Quo), and Brian Appleyard (drummer from East of Eden) . Singer Mickey Cox had been in Robert Plant’s pre-Led Zeppelin group The Band of Joy. It was Cox, in fact, who became their singer when Plant left the band. But suddenly, thanks to band management problems,the LP was shelved. Keith Law , who had written all of the songs, joined Velvett Fogg for their only album, and JARDINE was forgotten. Masochists of Strangulation, Execution of the Child and monumental dirge Blackbirds Of Jardine, which tells of self-same birds, and the fact that they will ‘destroy you, and leave you pain, pain, pain’, perhaps more akin to the band Comus than to anything else we have encountered from the psychedelic era. There are also heavy guitar solos, churning organ, flute, and flowing sitar for good measure. from a short-lived but charismatic band!